SNMV Institute of Management is located a Malumichampatti, Coimbatore. The programme was planned and coordinated by Prof. Nagaraj. 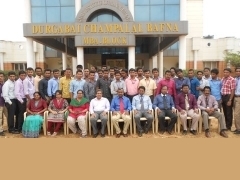 The institute is the first in the Coimbatore region to conduct such a value added course for their MBA Logistics students (affiliated to Bharathiyar University). Around 50 students and 2 faculty participated in the interactive programme happened during 17.2.2014 to 20.2.2014. The programme had a good mixture of games, student activities and lecture which made the participants to realize the fruits of the programme. For more information on CII Logistics preparatory programmes click here.